I’m working on my sermon for Sunday. The Gospel is Mark 6:1-13. The passage includes Jesus’ visit to his hometown where he was unable to do any “deeds of power” but did heal some people. It also includes Mark’s version of the sending out of the twelve. Jesus instructs them on how to receive hospitality and how to respond if they are not welcomed in a village. “Hospitality” is one of the key values of contemporary progressive Christianity, especially as mainline, mainly-white churches seek to welcome and include people of color, members of the LGBT community, as well as people of different socio-economic background. Often, such praiseworthy goals are connected with Jesus’ own practice of radical inclusion. Progressive Christians love to say things like, “Jesus practiced radical hospitality” or “Jesus welcomed all to the table.” Such arguments are made not just in our efforts toward great diversity and inclusivity, but also in the Episcopal Church in the ongoing controversy over inviting the unbaptized to receive communion. Such statements may reflect central values in contemporary progressive worship and theology but as Andrew McGowan notes in a blog post, they don’t correspond to the gospel records of Jesus. the welcoming, inclusive, festive Jesus may be a common feature of many scholarly portraits; he is not, however, a strongly-based historical one. Jesus was most clearly someone willing to eat with diverse company, less an inclusive host than an undiscriminating guest. Jesus appears as host only in quite different and more historically contentious material, relative to that where he is depicted as keeping bad company or being a wine-bibber. The “guest” traditions about him are generally defensible; the “host” traditions tend to be more influenced by later reflection than material that scholars in general would actually attribute to the historical Jesus. Meals were important to ancient Mediterranean society, Jewish and Greco-Roman alike, as venues for the expression and creation of social relationships—not just among families, but for professional guilds, interest groups and, of course, for religious purposes, too. Meals were venues for politics as well as piety, business as well as pleasure. It is hardly surprising that we find Jesus actively participating in this meal-culture. It was the most obvious means for many types of social interaction, and the carefully-crafted Gospel pictures of Jesus sharing others’ tables certainly have a reliable core. Nor should we forget the even more basic reality of physical need. Jesus was apparently an itinerant without direct means of support, and his willingness or even desire to be included indiscriminately is not really so surprising in itself. Hunger makes for interesting and diverse table fellowship. In our gospel for this week, Jesus’ instructions to the disciples help them to receive hospitality, not give it. In many ways, that is more difficult for us. Offering hospitality, especially in the Church, comes from a place of privilege. Receiving hospitality requires vulnerability. That’s true in our worship and in our outreach programs. Is there any verse of scripture more familiar to American Christians than John 3:16? For decades, it was prominently displayed at major sporting events; one can see it on bumper stickers; the verse (if not the words) even appears on tattoos. In fact, it is so ubiquitous especially among Evangelicals, that Christians of other stripes, progressive ones, might be offended when they see it. It’s one of those markers of identity that are as likely to alienate as they are to attract; to divide insiders from outsiders, to condemn rather than invite. In the later verses of this passage, there is condemnation and judgment. But above all, there is also love, God’s love. The passage confronts us with the question of our conception of God, our understanding of the fundamental nature of God. Is God a God of love or a God of judgment? We might be inclined to see these two attributes as equal. Certainly, both are important and both are intrinsic to God’s character. But in this passage, love wins. “God so loved the world.” This little sentence is really quite remarkable for John’s gospel. Everywhere else in the gospel, consistently, the world, the cosmos, is depicted in opposition to Jesus Christ. And that’s the case even though in chapter 1 the gospel writer proclaims that God created the world. Now we learn that the God who created the world loves the world. Indeed, God loves the world (not just humans, the created order) so much that God gave God’s only son that we might have everlasting life. The judgment here comes not from God but from the human beings who reject God in Christ. To use the gospel’s imagery, “the light has come into the world and people loved darkness rather than light.” That offers a different perspective on things. Instead of fearing a just and righteous God, we need to fear our own desires and choices—to preserve the dark and hidden corners of our lives and to live in the dark and hidden corners of the world. This Sunday’s texts are available here. 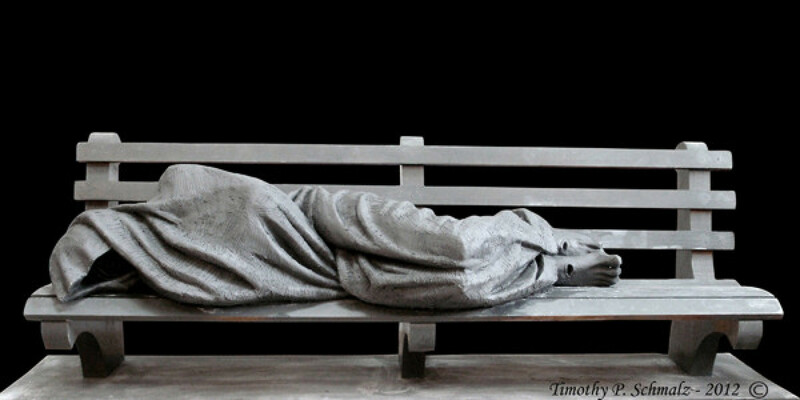 Canadian sculptor Tim Schmaltz has incited controversy with his bronze statue “Jesus the Homeless.” The image gained notoriety when it was rejected by St. Patrick’s Cathedral in New York City and St. Michael’s Cathedral in Toronto. The latter image was installed at the Jesuit School of Theology in Toronto and another cast was purchased and installed at St. Alban’s Episcopal Church in Davidson, NC. The statue depicts a homeless man sleeping on a park bench. His facial features are partially obscured by the blanket that covers him but the marks of crucifixion on his hands and feet clearly identify him as Jesus. After the statue appeared in Davidson, the police were called by a woman who thought it was a real homeless person and others complained that it demeaned the neighborhood. One woman was quoted as saying, “Jesus is not a vagrant; Jesus is not a helpless person who needs our help.” (A story on Huffington Post with images of the statue is here). The Kingship of Christ, the Reign of Christ, is not primarily about recognizing Christ in majesty and triumph. It is about being Christ—in the weakest, lowliest, and most vulnerable of humans; in feeding and clothing, ministering to and being with the stranger, the sick, the friendless. In acts like these, the reign of God is announced and made present. The reign of Christ is proclaimed in a homeless Jesus. I desire, as I have for many years, to come to you 24when I go to Spain. For I do hope to see you on my journey and to be sent on by you, once I have enjoyed your company for a little while. He does have personal relationships with a number of the Christians in Rome and sends greetings to many of them. It’s somewhat misleading to use “church” or even “Christian” when referring to the communities to whom Paul was writing. Chapter 16 makes clear that he knows of a number of communities that gather in individual homes and may not have close connections with each other. Unlike most of Paul’s other letters, Romans is not written in response to conflict he is aware of, or in response to questions or issues that have developed. Instead, Paul is addressing the issues that he thinks are most important; above all, the relationship between these Gentiles who believe Jesus is the Messiah and Jews, some of whom also believe Jesus to be the Messiah, and many others who have rejected that idea. It’s likely that there are some Jews among the Christians in Rome, but it’s also likely that part of the issue for Paul is making a case for the continued inclusion of Jewish believers in these communities. It’s also important to note that the traditional Protestant interpretation of Romans that focused on matters of individual justification and salvation and viewed Paul’s argument as a rejection of Jewish law, however compelling that may be, is probably not what Paul originally intended. Who was the first person to “teach” Paul’s letter to the Romans? According to Michael Byrd, Phoebe. I’m surprised this year by the abrupt changes in the lectionary in this season after Pentecost. As we move into Ordinary Time, there are almost no sign posts or markers to help us orient ourselves to the Sunday readings. The Gospel plops us back into the middle of Matthew, which apart from its appearance on Trinity Sunday (28:16-20), we’ve not encountered since Holy Week and Easter. And even that was something of an intrusion into our long sojourn with the Gospel of John (from the Second Sunday of Lent through all of the Sundays of Easter). The gospel reading includes sayings about discipleship that are quite challenging but consistent with Matthew’ overall depiction of Jesus. Almost as disorienting is the reading from Genesis (we’ll be following Track I or the “semi-continuous” readings from Hebrew scripture). But again, we’re plopped into the middle of a much longer narrative arc. We hear the difficult and distressing story of Abraham casting Hagar and Ishmael out into the wilderness. This comes long after God’s call of Abraham in Genesis 12; long after the promise that Abraham and Sarah would give birth to a mighty nation; after Abraham’s two attempts to take matters into his own hand (first by naming Eliezer as his heir, then by impregnating his slave Hagar). The story of Abraham is a story of call and response, of the covenant God made with Abraham, a story of Abraham’s faith and God’s faithfulness, and a story of promises deferred. Abraham’s story ends with the only land he possesses the burial plot he purchased for Sarah, and his only offspring a son Isaac. The Gospel reading this week is one of the most interesting pericopes in any of the gospels. It offers a view into the world of first-century Judaism and the lively debates that were occurring over the nature of scripture, of scriptural authority, and of the doctrine of the resurrection. First, a little background. Jesus has come to the end of his lengthy journey to Jerusalem (it began back in chapter 9 of Luke’s gospel; for us it began back in June). We’ve jumped over the Triumphal Entry and the Cleansing of the Temple. Luke has returned to Mark’s chronology here and like Mark, he has Jesus teaching in the Temple. As he teaches, he is confronted by various groups of his opponents–Pharisees, for example. They pose questions to him, they are seeking to trap him in some way so they can bring him up on charges. In this week’s gospel, the group challenging Jesus are the Sadducees. They are aristocratic, well-connected, conservative. It’s likely that they are among the chief beneficiaries of Roman rule. As leaders of the Temple cult, they are also in position to benefit economically from their position. We know relatively little about them; in fact, much of our knowledge derives from what the gospel writers tell us in this incident. They reject the doctrine of the resurrection of the dead. It’s also the case that they believe only the Torah, the first five books of the Hebrew Bible are authoritative. That narrow understanding of scripture helps to explain why they reject the doctrine of the resurrection. It’s very hard to find evidence for that doctrine in the Pentateuch. They come to Jesus trying to force him to take sides on the resurrection (it’s common belief among the Pharisees, for example). So they use the example of Levirate marriage; the custom that if a man dies without an heir, his brother is obligated to marry the widow and provide an heir. Jesus doesn’t take the bait (he never does in these confrontations). He points out that life in the age to come is qualitatively different than life in this age–that there is no marriage, or taking in marriage. It’s interesting, though, how he argues against the Sadducees. He quotes from Exodus (one of the books of Torah), to make the case that “God is the God of the living and not the dead.” He appeals to Exodus because the Sadducees consider it authoritative. Had he quoted this week’s reading from Job, or any of the other texts in the Hebrew Bible that seem to imply resurrection, the Sadducees would not have considered it valid because they didn’t think those texts were authoritative. What makes this text so interesting is that it opens up the internal debate within first-century Judaism over the nature of scripture, of scriptural authority, and over the resurrection. It’s easy for Christians to read the Hebrew Bible and Jewish history through the lens of 2000 years of Christian history and theology and to assume that ideas that are now considered central doctrines were contested in earlier centuries. The resurrection of the dead was a topic of much debate in first-century Judaism for one simple reason. It was an innovation. We can see its origins in Daniel and Ezekiel (remember the dry bones?) but even centuries later, in Jesus’ day, it remained a controversial doctrine. And so it remains today. I wonder how many “good” Christians really believe that one day their physical body will be raised and reunited with their souls. The lesson from Lamentations and the Psalm this week are both responses to what was perhaps the most traumatic event in the history of God’s chosen people up to that point. In 596 BCE, after hundreds of years of survival against unbelievable odds, the kingdom of Judah was defeated by the Babylonian empire. A decade or so later, after an unwise rebellion, the armies of Babylon came in and finished the job. They destroyed the temple of Solomon, the city of Jerusalem, and carried off all of the most important people into exile in Babylon. Decades later, after Babylon was conquered by Persia, the exiles were permitted to return home and to rebuild their lives, their city, and their temple. It was then, amidst the scars of that destruction, that both the Psalm and the lamentation we heard were composed. The reading from Lamentations describes Jerusalem as it stands after destruction. It lies empty, lonely, no one comes up to the annual festivals. Her priests groan, her young girls grieve. But the author places blame for Jerusalem’s fate squarely on God. God has caused this suffering because of Jerusalem’s many sins. So the punishment is just. The Psalm gives voice to the suffering and grief of refugees. “By the rivers of Babylon we sat down and wept when we remembered Zion.” The words of the psalm evoke deep feelings of regret and sadness at living in exile. In a far away land, they were expected to build new lives and also to entertain their captors. Without hope of return, and perhaps even doubting whether their God would ever hear their cries and respond to their situation, they mourned the loss of their homeland and also, probably, the loss of their faith. Harsh and offensive language, isn’t it? Language, and sentiments, that we hardly like to acknowledge. Indeed, the liturgist’s first impulse is to leave those two verses out of our worship. Even John Wesley is reported to have said that the words of the last verses of Psalm 137 should never be on the lips of any congregation. Yet there they are; and they are as much a part of that Psalm as the words we like. Moreover, they are the product of the same experience, most likely, the words of a single author. We live in a world in which the plight of the refugee has become commonplace. In the 1990s we became accustomed to seeing images of people in the former Yugoslavia being forced out of their homes—Bosnian Muslims, Croatian Serbs, Kosovars. Millions have been displaced by the conflict in the Congo. 2 million have fled the fighting in Syria in the last two years. And there are the Palestinians—forced from their homes and land sixty years ago, millions live in refugee camps. Human rights groups estimate that there at least 14 million people who have left their countries because of war or natural disaster. Iraq alone counts for some 2 million. In addition, there are more than 20 million people who have been forced from their homes but are living somewhere else in their nation. This psalm, written by a refugee, reminds us of the scars and pain caused by conflict. The last verses remind us as well that overcoming conflict, and healing that pain can be almost impossible. Yet to deny refugees the full depth of their pain is to deny the reality of their experience. Most important of all, perhaps, we can see in the emergence of the Jewish people out of that experience of exile, a new, deeper understanding of who they were, and who their God was. We can’t expect today’s refugees to understand themselves and their experience in the ways the Jewish people did during the exile. The reality is that for most humans to be driven from one’s country and one’s land is a deep and lasting wound. Most refugees would echo the sentiments of those last few verses and would continue to search for ways to make that vision a reality through the use of violence. Perhaps that is why the lasting conflicts in our world seem to go on forever. Old wounds never heal; and ethnic and national groups may continue to seek vengeance for crimes committed decades, or even centuries ago. So for us to speak the words of Ps. 137 is to enter into the lives and experiences of people whom we don’t know, but whose suffering is profound and real. We may not understand or be able to plumb the depths of their pain, but the words of the Psalm and of Lamentation are a powerful reminder of their lives and suffering. We may find such experiences unfathomable, even though we are familiar with the images on TV. We have no idea how we might respond if we were faced with such a situation. And too, when we wonder how we might help those in need, we can do little more than wring our hands or write a check. Indeed, like the psalmist who wrote the words of Psalm 137, we too have no idea how to respond when faced with such suffering.